The Nativity, an Eerdmans Book for Young Readers, is a vividly illustrated book that retells the story of the birth of Jesus. All the wonder of that special night is captured between the beautiful text and the magnificent illustrations. Children of all ages will love hearing and seeing this modern edition of the King James Version of the biblical portions of the Gospels of Matthew and Luke that retell the story of the birth of Jesus. Each two-page spread in this oversized (8½ x 11) book pairs a full-color illustration with a Gospel passage from Luke or Matthew telling part of the Christmas story -- including the appearance of the angel Gabriel to the Virgin Mary, Christ in the Manger, the visit of the shepherds, Herod’s chilling decree, the Three Wise Men, the flight Into Egypt, and the return of the Holy Family to Nazareth. The pictures bring the story to life for the reader through luminous paintings by the illustrator Ruth Sanderson. The illustrations are well done and will help grab and keep the attention of the young reader and aid them in understanding the accompanying verses. The style Sanderson uses is reminiscent of traditional Eastern Orthodox icons, drawing on the traditions of medieval manuscript illumination and Old Master painting to create a sense of timeless beauty and significance. Elaborate borders combine the traditional elements of an illuminated manuscript with a contemporary palette to make this spectacular volume a book to be treasured and shared. 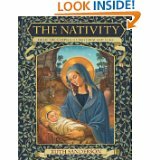 This book is a wonderful introduction to the story of the Nativity and would make a gorgeous and timeless gift for a child for Christmas.